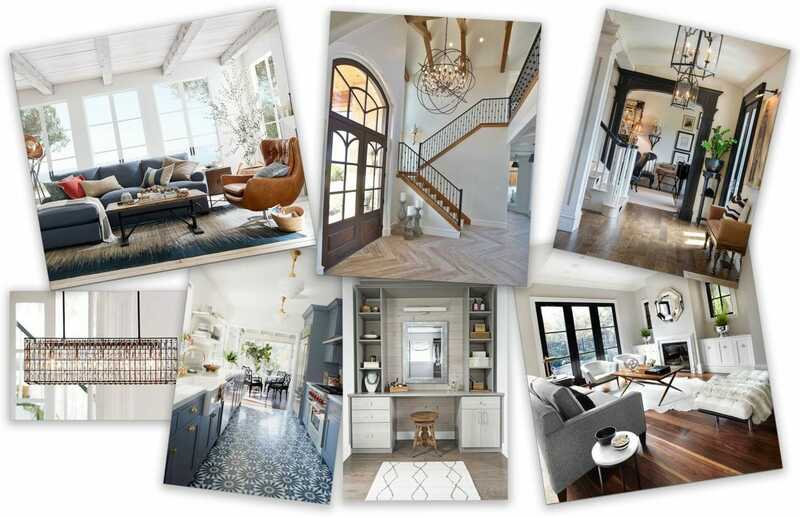 To illustrate the ideas to the designer the client shared her Pinterest board with the designers to give them a feel of her overall style. 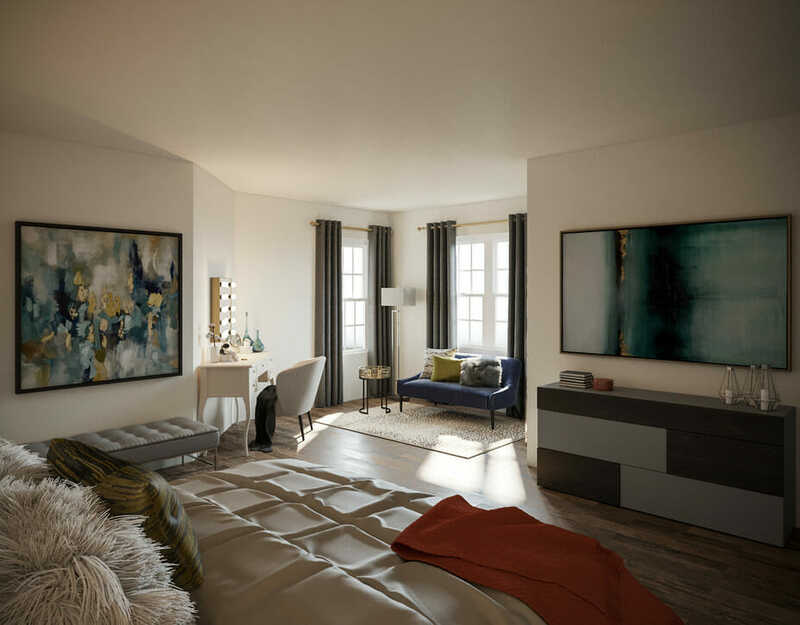 The warm wood tones and color pops are what the client envisioned for the space. 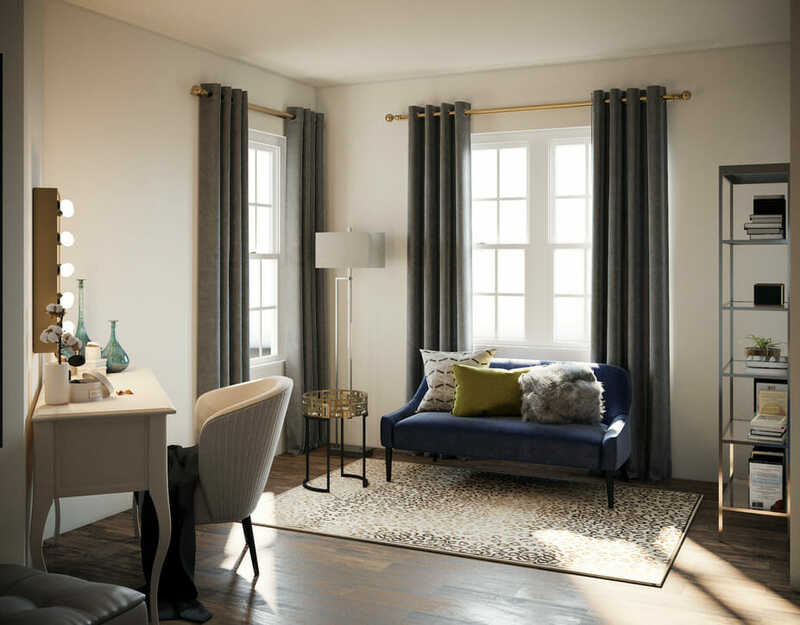 Then the goal was to create a space that felt cozy and lived in all while feeling put together and sophisticated. In addition, choosing striking lighting was also very important in making the house feel unique. 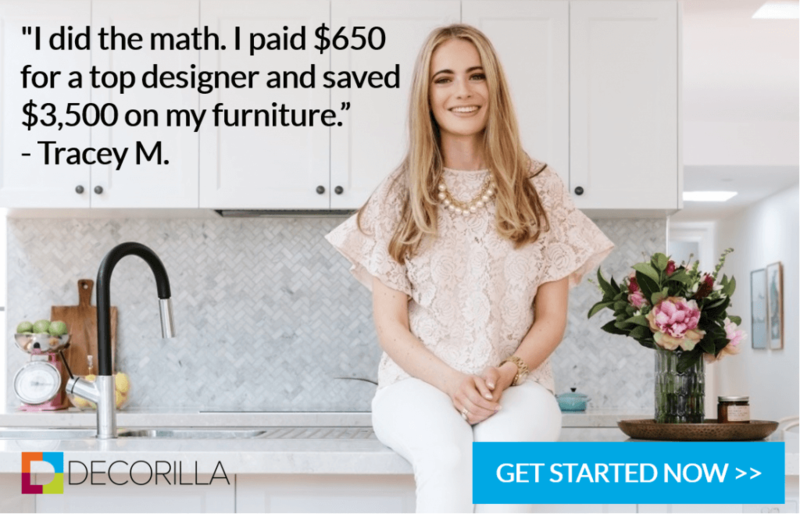 Next, the clients chose between multiple proposals from Decorilla’s online interior designers. 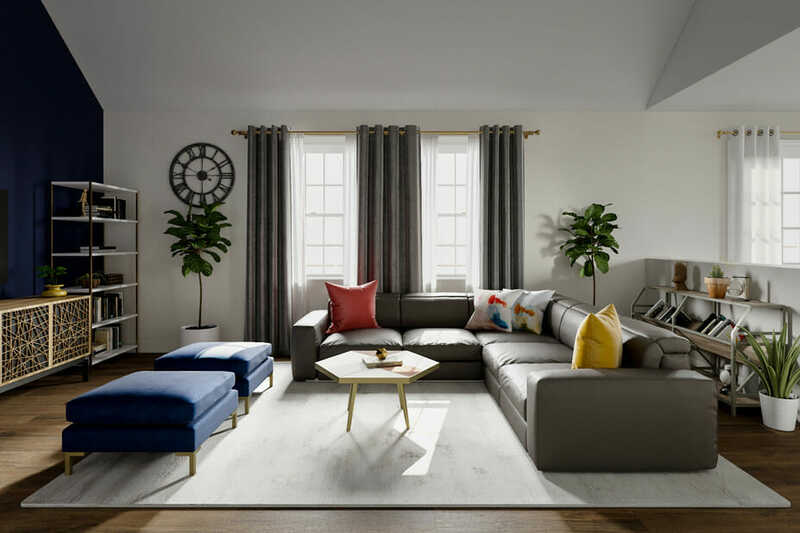 After some contemplation, they chose to go with the mix of classic, modern and eclectic presented by Sonia C. After the inital moodboards were received the client was able to ask questions and contemplate before making the important decision. 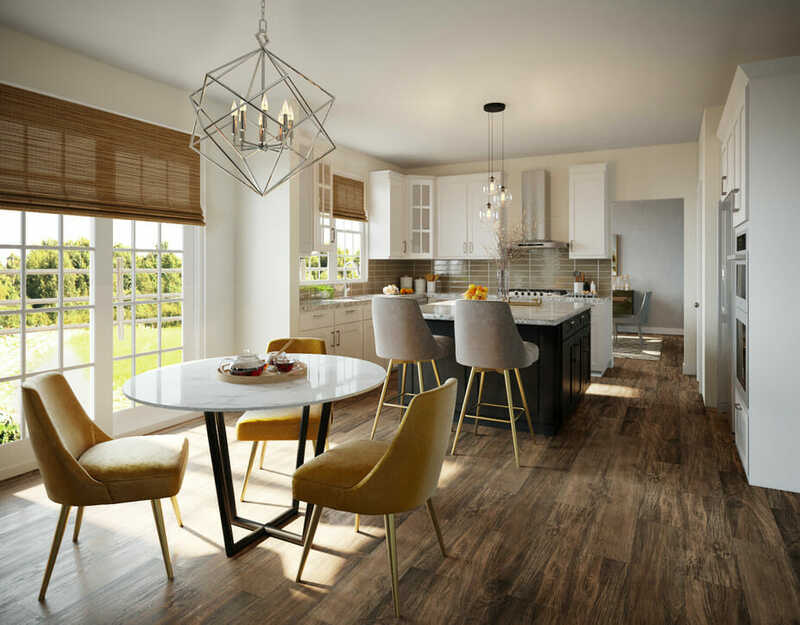 Then, once Sonia was chosen she was able to help the homeowners choose all the finishes, furnishing, art, décor, and lighting for their new construction home. 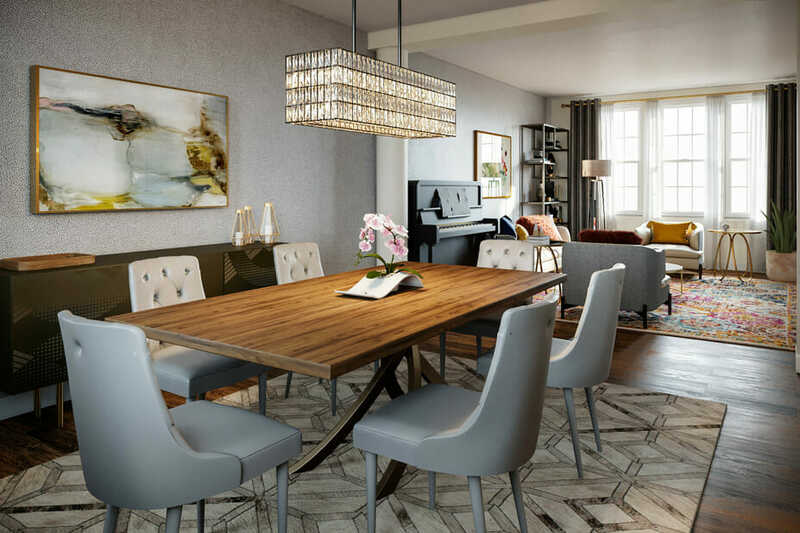 In addition, having an interior designer by your side throughout the process makes decision making so much easier in what can easily feel overwhelming. 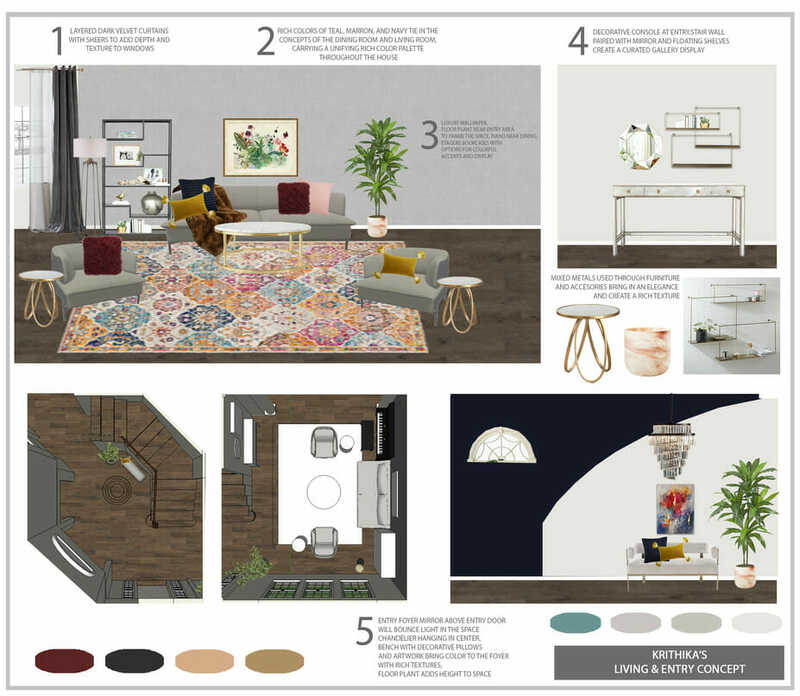 Initial foyer and living room moodboard by Decorilla interior designer Sonia C.
The initial moodboards were a great starting off point to begin and visualize the design. 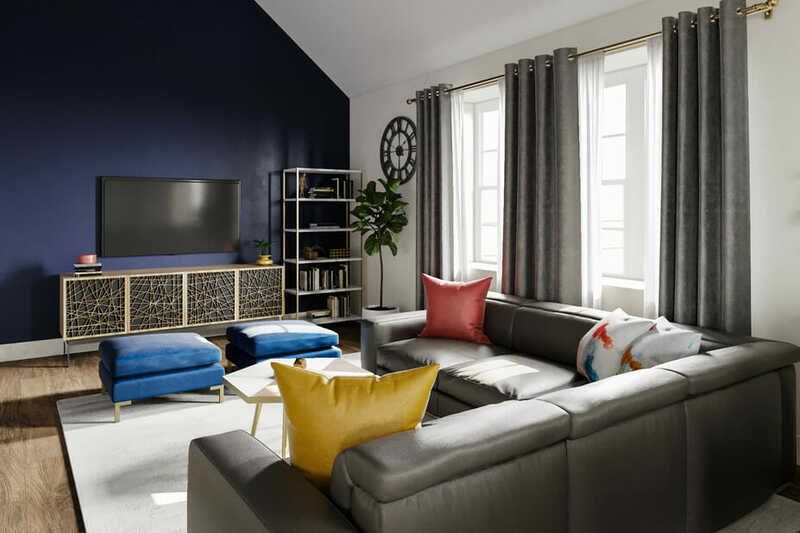 Not only were the clients able to see layouts, color schemes, furniture and décor choices, Sonia was sure to choose furniture that was family friendly. Another request was to suggest creative storage solutions to minimize clutter. Something I think we can all agree with! 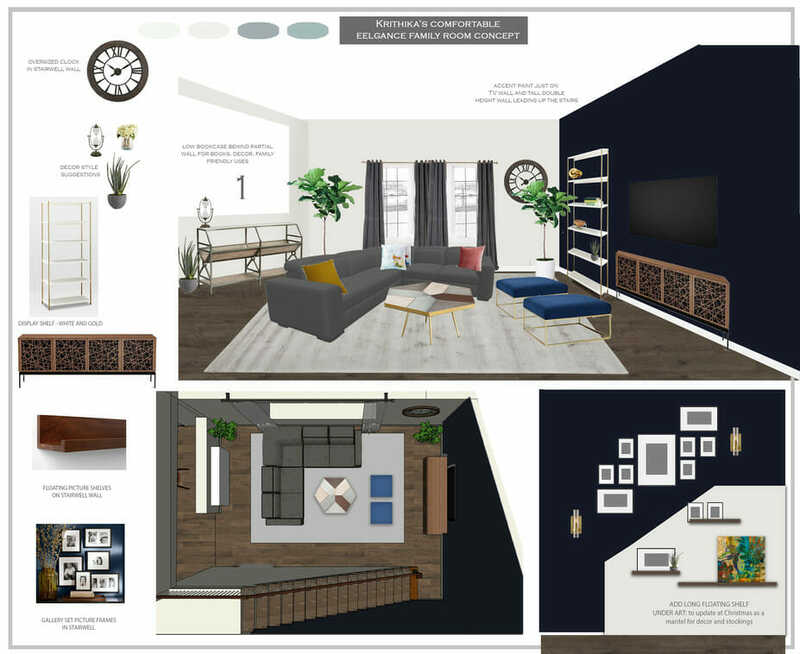 Initial family room moodboard by Decorilla interior designer Sonia C.
Each room has its own personality, but they blend together seamlessly creating a unified feeling throughout the home. In particular, the personal touches like a gallery wall for family photos above the stairs add a personal touch to the room. At last, we start this eclectic home tour in the kitchen, otherwise known as the heart of the home. 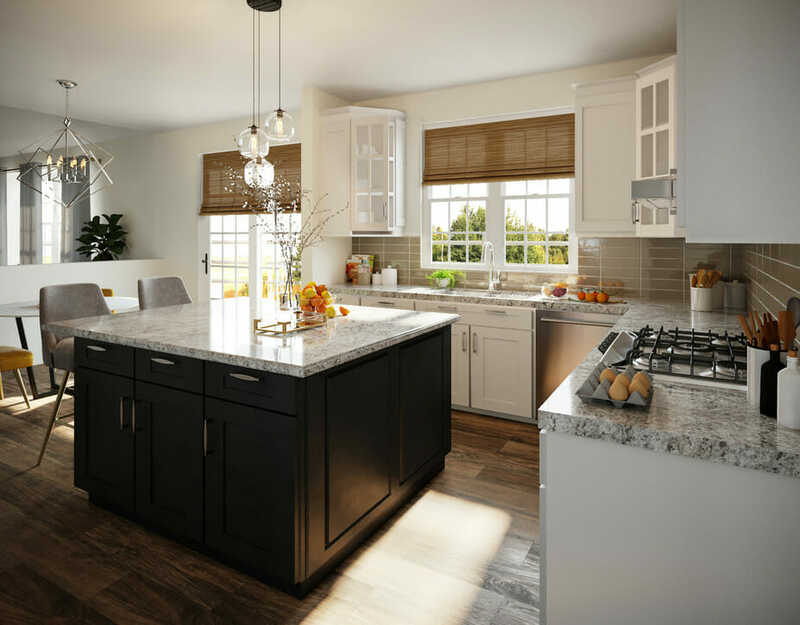 The white wood cabinets with contrasting island make the space feel more cozy and grounded. Another favorite eclectic decor feature we love is the subway backsplash. 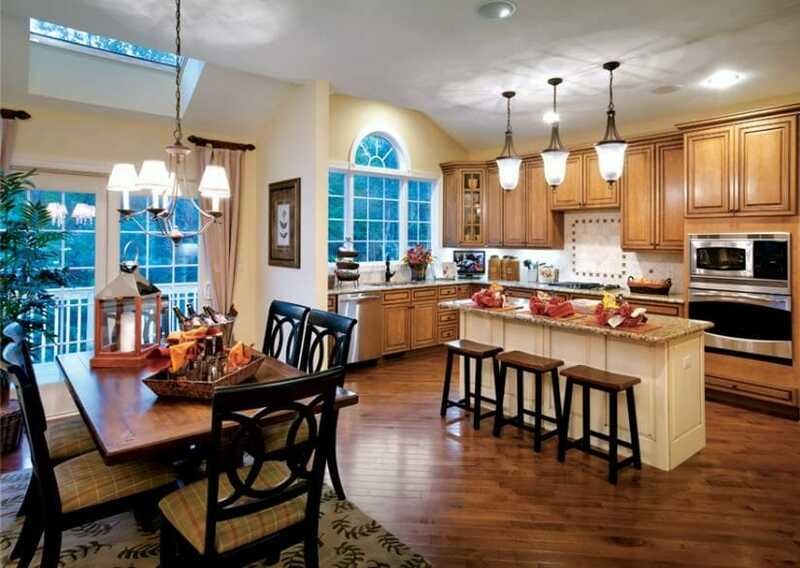 Not only does it bring in the warm wood tones from the floor, it also contrasts perfectly from the light countertop. In addition to the seating at the island, the kitchen had the right amount of room for a small eating nook. This multi-use space can be for anything from sipping your morning cup of coffee to doing homework at night. The dining area is quite the show stopper with the gorgeous chandelier. 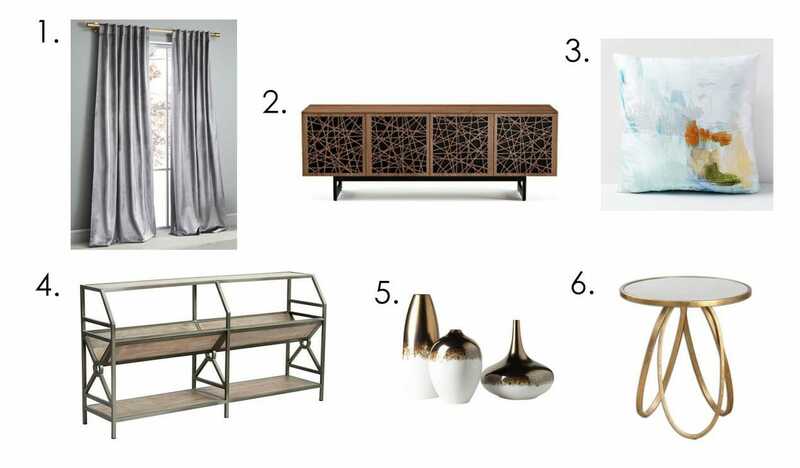 Sonia paid attention to detail and selected lighting similar to what the client was loving on her Pinterest inspiration board. The client’s original dining table is complimented by a new credenza and kid friendly chairs. The client wanted the family room area to feel more playful than the other spaces. 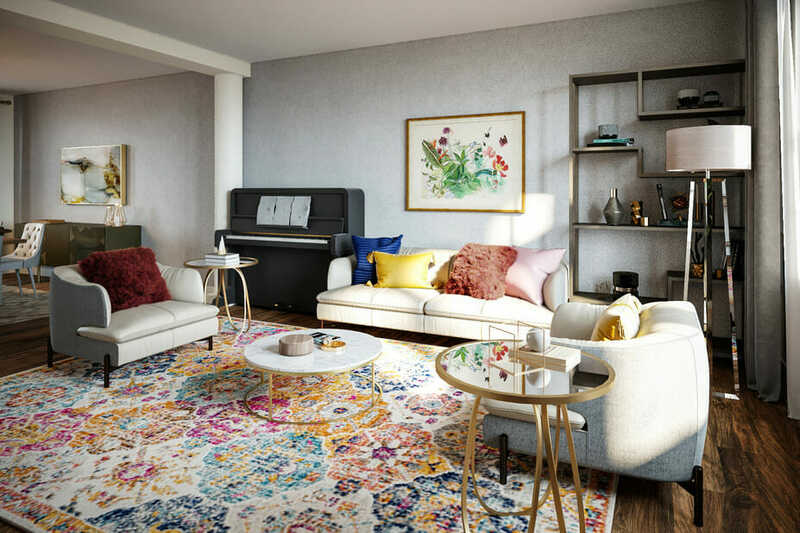 This eclectic interior design example is the ideal blend of playful and sophisticated with the use of primary colors, and fun pattered furniture. The toy storage behind the sofa is a great way to conceal any unwanted clutter. All of the furniture selections were carefully sourced with family friendly finishes in mind. The sectional material can be easily wiped clean with a damp cloth, making sticky fingers a lesser burden! The goal of the master bedroom was to create a light and airy space that felt like a cozy oasis. One of our favorite eclectic décor ideas is oversized art. They add interest into the room without making it feel overwhelming. The calming blue tones are the perfect addition to promote a good night’s sleep. One of the client’s original requests was an area with bright lighting to do her makeup. This lounge area in the master bedroom was the picture-perfect place for the vanity. 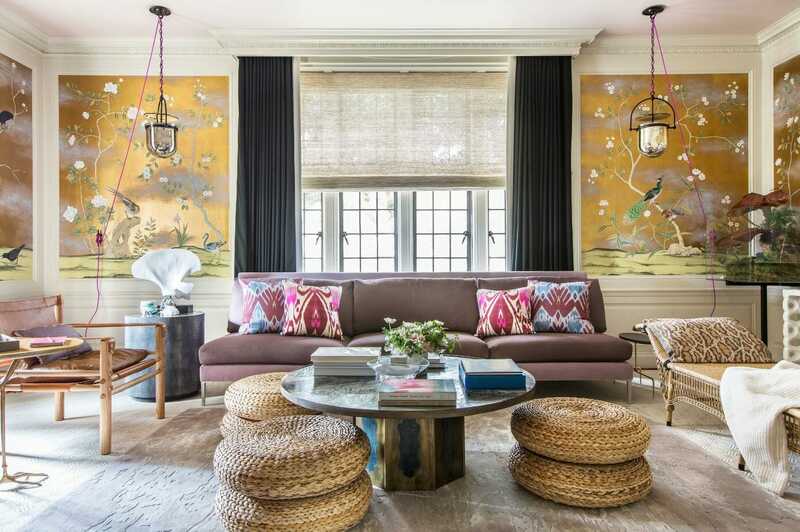 The mix of textures is a common eclectic home interior design trait we love to see. 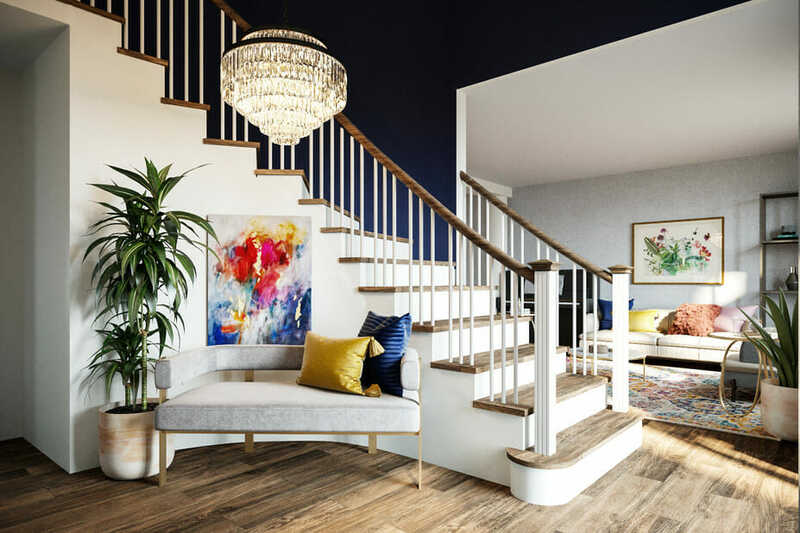 With the help of online interior design this client was able to achieve the dream eclectic home design they’d been hoping for in their new build home. No matter what step in the home buying or renovation process you’re in, interior design help is only a click away. Schedule a free consultation today and you’ll be paired with the perfect online or in home interior designer for you!